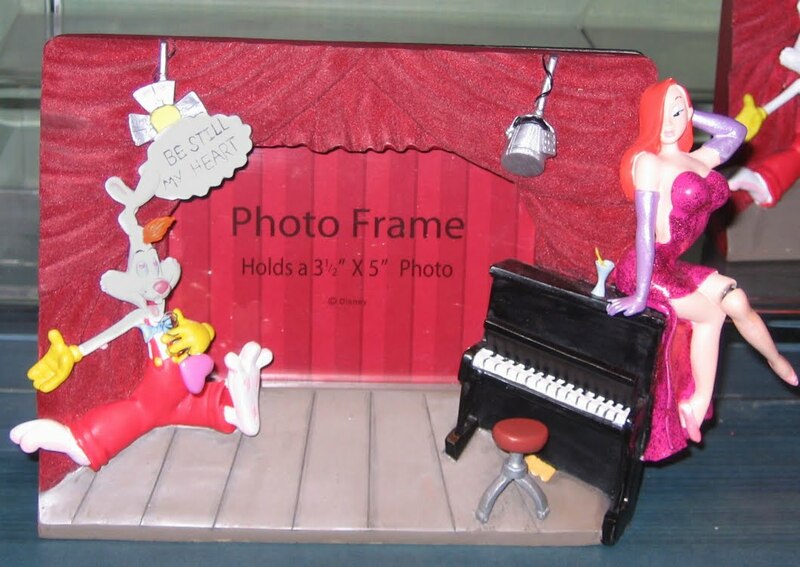 For a long time, Disney created various three-dimensional sculptured character frames. From Ariel, to Mickey, to Winnie the Pooh, to Lilo and Stitch - just about every character was created. 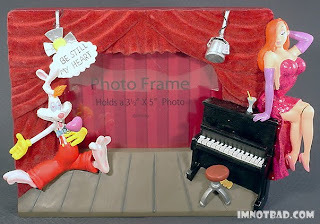 In 2004, Disney finally made a Roger and Jessica character frame - although looking back it's probably something that should have waited a few more years. When a few of these frames began to pop up on eBay, I made a call to Disney and placed an order for two of them. When they did not arrive, I had to call Disney, only to find out they were indeed delivered. It appeared the package was sent to the wrong address down the street. Where the other two ended up I don't know, but this was not the last time one of my Disney packages was sent to the wrong address. 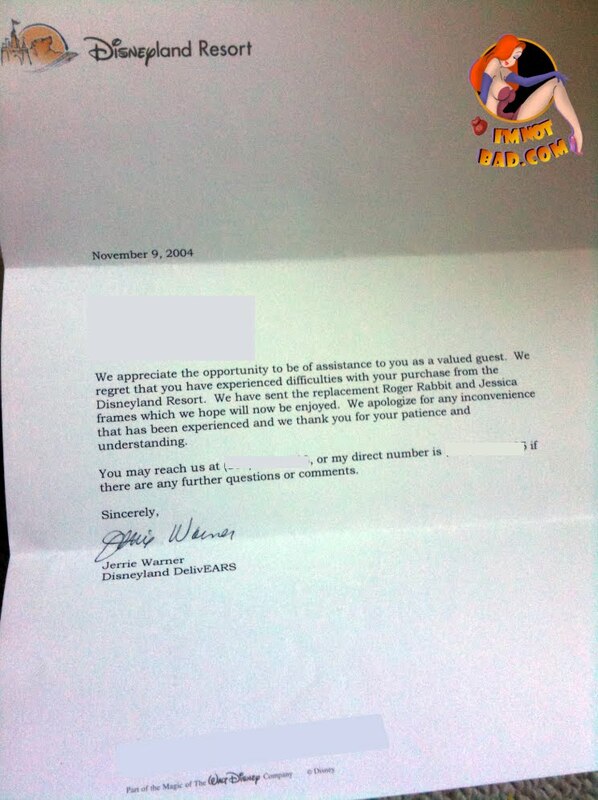 Disney was nice enough to replace both frames free of charge to me and I did get them, along with a nice note of apology. The frame is boxed okay, with a little styrofoam and plastic for protection. These cost $20 each and it would have been worth every penny, except the work on Jessica is not well done at all. Starting with Roger, he actually came out the best in this. As usual for anything we're seeing at this point in time when the couple is together, Roger has pink hearts in his eyes. 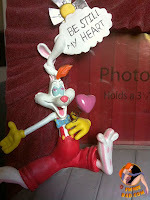 His ears are all twisted together and there is a word balloon coming from his head saying, "Be still my heart!" 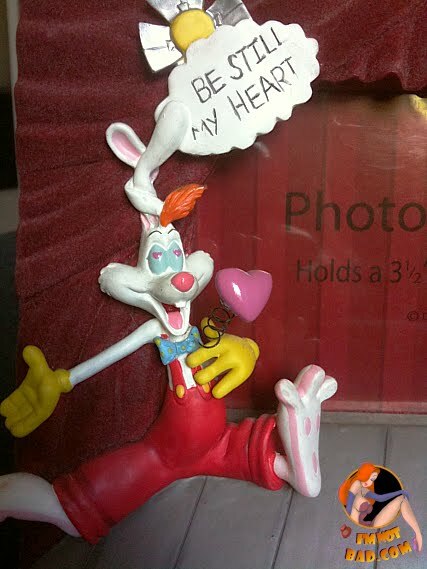 They cleverly added a small resin heart which is attached to a spring, popping out of Roger's chest as he gazes at his wife. At least I think that's supposed to be his wife. Maybe the hearts in his eyes are blinding him from the fact that there has got to be some sort of impostor in place of Jessica. This sculpture of Jessica is one of the poorest yet. The face is way off for her, and sadly the paint is terribly sloppy. Her gloves are a pearlized purple, which would be nice if it had been uniform. It's very blotchy and uneven. Her dress has glitter on it and again the application of it is awful - which you can see. They did something to her eye, which looks printed or stamped on in some manner, that throws this off the most. Had that been correct, it would have made my opinion a bit better in spite of the shoddy work on this piece. The red curtains flocked, giving it that fuzzy feel and texture. There are some spots that do not have as much flocking making it look bald in some areas. Luckily there is red paint underneath, so its harder to see. 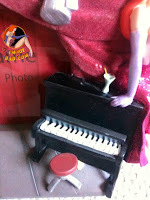 Jessica is sitting atop a piano, which is actually made fairly well. The paint is even, despite the way it looks as there is dust covering it from display (I had no issue displaying this, unlike other items I have.) A small cocktail glass and bar stool ironically work well into this frame. You'd think pieces that small would not have even made it on here. There are also some spotlights hanging overhead which don't really need to be there, but I suppose work well with the frame. 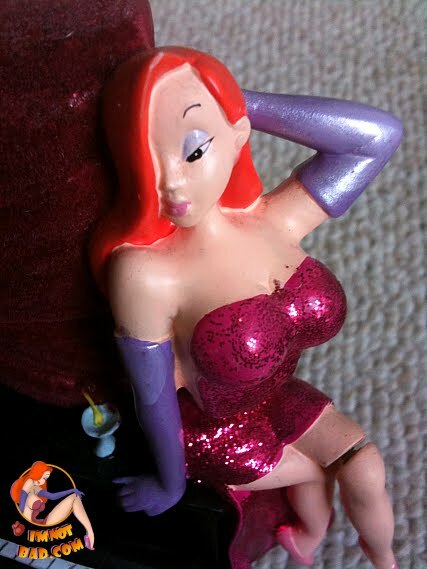 Jessica Rabbit has an extra feature like Roger; a swinging leg. 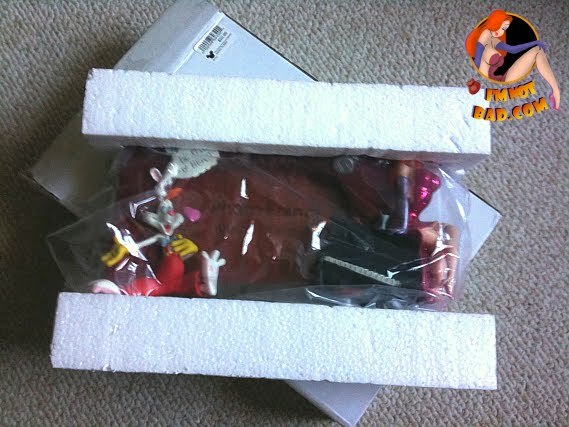 Most of the time I have seen this on eBay, the description states you can pose Jessica's leg. I ended up getting two more of these frames, and out of all four - only one had a leg that worked correctly. They are not meant to be posed like an action figure. The leg should bobble and swing when you touch it. I've rarely seen one that is correct. I don't know if this means the majority of the frames were broken, or if they were changed from the swinging leg, to a poseable one for some reason. The Roger and Jessica Character Frame gets a 2. I'm tough on this item because I expected so much more from it. The quality is lacking, the moving leg issue is a mystery, and the paint is sloppy. I do enjoy it though - it's one piece I don't mind displaying, since if it gets damaged I won't really be that upset. You can still find these on eBay often.